Watertown is 99 years leasehold luxurious condominium located in the northeastern part of Singapore. 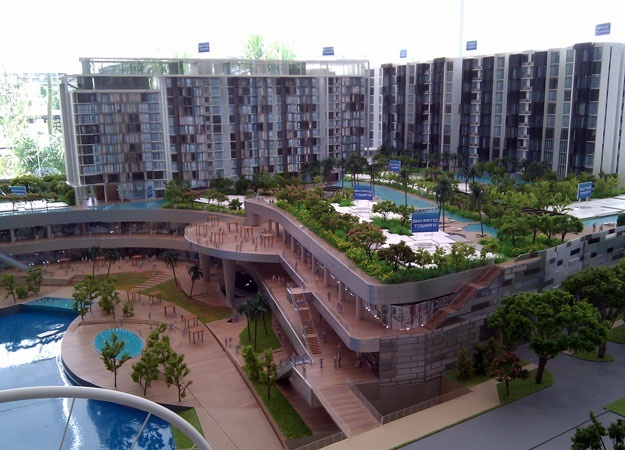 This world class mixed development consists of residential blocks and a shopping mall called Waterway Point. It is located at Punggol Central in District 19. This beautifully designed architecture is expected to be completed in 2017 by the reputable Far East Organization, Frasers Centrepoint and Sekisui House Ltd.The total site area is about 29,999.30 sqm. Rsp Architects are the main architects for this development. This elegant condominium has 11 blocks with a total of 1001 spacious units. The Watertown offers a range of housing types ranging from SOHO (2-3 bedroom compact), Suites (1-2 bedroom), Condo (2-3 bedrooms) to Sky Patios (2-4 bedrooms). 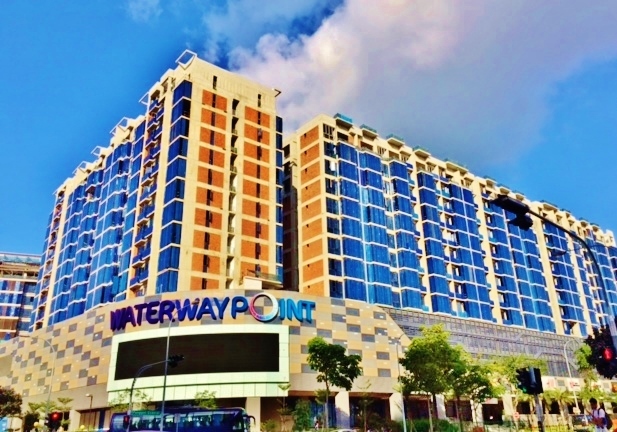 The Waterway Point shopping mall has 6 levels in total; 4 above ground levels and 2 basement levels. There will be F&B, Retail and entertainment outlets at the mall. The mall is expected to be completed in 2015.
tiredness accumulated and seek inner serenity. The SOHO is equipped with lap pool, Business Pod, Lounge Deck, Lounge Cabana, dining Pod, Hammock Terrace, Tree Grove, Reflective pool and Outdoor Fitness Zone. The Condo is equipped with a lap pool, Reflective pool, lounge pool, hydrotherapy pool, lounge cabana, open deck, lily pond, water dining pavilion and outdoor fitness zone. The Suites is equipped with lap pool, lounge deck, , spa pool, hydrotherapy pool, dining villa and also outdoor fitness deck. The sky patio is equipped with dining villa, kid’s play zone, lap pool, reflective pool, spa pool, hydrotherapy pool, open deck, Tree grove, BBQ cabana, deck terrace, landscape garden, gym, tennis court, Watertown villa and spa steam room. There is also a car park with 1665 lots and 24 hours security here. The myriad of in house facilities exclusively created for residents will pamper you to the max. In a class of its own, Watertown, it is favorably located within the proximity of major roads and public transport. The nearest Mrt station is Punggol Mrt/LRT station which is 0.05 km away. It is also located near to Buangkok and Sengkang Mrt stations. There are several bus services available here. Driving to Central Business District or Orchard Road will only take you about 20 minutes. Major expressways like TPE, KPE and CTE are seamlessly and conveniently connected to every part of Singapore making it so hassle free for you to travel to work or play. 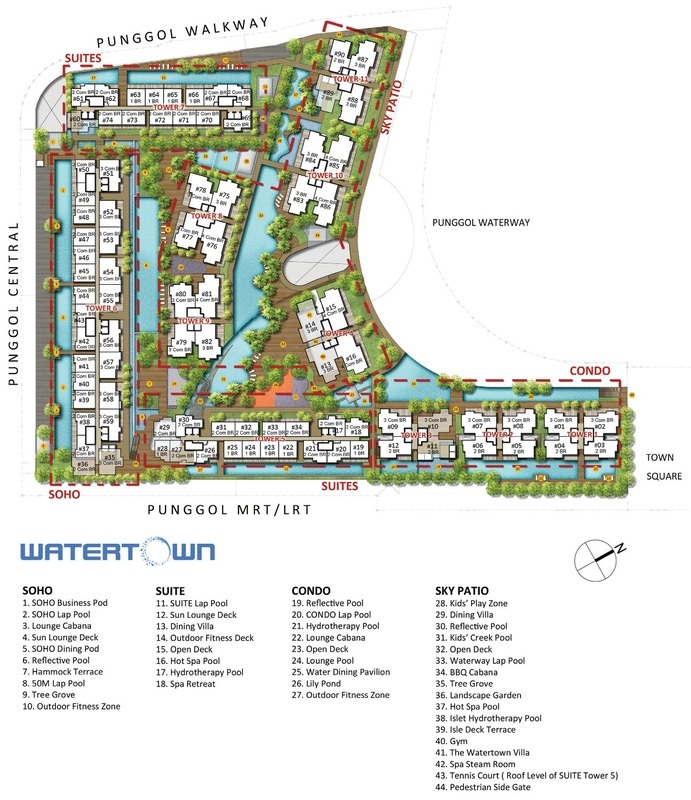 Watertown is in the heart of Punggol new town. Residents here can head down to nearby malls such Waterway Point Mall, Rivervale Plaza, Rivervale Mall, Hougang Mall, Compass Point and Punggol Plaza to shop, fine dining, catch a movie, banking and grocery shopping. To enjoy more local delicacies, you can head down to the famous seafood restaurants at Punggol point or eateries in Sengkang and Pasir Ris. The nearest supermarkets are Cold Storage at Compass Point, NTUC Fairprice at Rivervale Mall, Sheng Siong Supermarket at 301 Punggol Central and Prime Supermarket at 108 Punggol Field. Other recreational facilities include Punggol Promenade, Punggol Waterway Park, Punggol Point, Marina Country Club, Sengkang Riverside Park, Sengkang Community Hub, Sengkang Sports and Recreational Centre. Over here, you can indulge in food and retail therapies as the slew of amenities are just a stone’s throw away. The bountiful mix of entertainment around you will definitely uplift your spirit. The primary educational institutions around include Edgefield Primary School, Horizon Primary School, Compassvale Primary School, Rivervale Primary School, Greendale Primary School, Punggol Primary School and Sengkang Primary School. The Secondary Schools in the neighborhood include Sengkang Secondary School, Greendale Secondary School, Compassvale Secondary School, Mee Toh School and Punggol Secondary School. For medical consult, you can head to the nearby General Practitioner Clinics, SengKang and Pasir Ris Polyclinic, Ren Ci Hospital, Bright Vision Hospital and Changi General Hospital in the area to provide specialist healthcare services for the residents. Watertown is a prestigious home of timeless appeal for the privileged few where you can luxuriate in the lyrical moments of life. It is a highly sought oasis with architectural bliss within the picturesque beauty of lush natural environment. Take a retreat in the sensory abode with all your favorite indulgences in close proximity. Living here in this urban sanctuary reflects the ultimate dream that make any other possession secondary. It is definitely a true work, play and live nature retreat after a long day at work. Here, you can live your life according to your own rules. Right here, you can find equilibrium and tranquility and get fully recharged for new challenges ahead. It is indeed a perfect dream home for everyone.